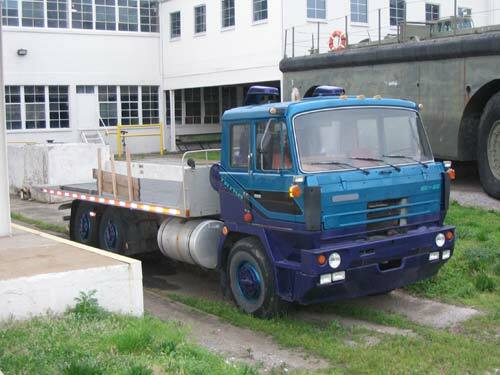 The Tatra T 815- series of heavy trucks, now known as Tatra TERR No.1, are the bread-and-butter model of Tatra. Almost infinitely configurable from 4x4 to 12x12, with either air- or water-cooled engines by six manufacturers, 3 types of manual, automatic, or electronic transmissions by three manufacturers, 2 passenger, 2+ sleeper, or 8 passenger cabs, with a tipper bed, dump bed, fifth wheel, crane, fire equipment, armored, weaponized, NBC-capable – you get the idea – it’s a remarkably capable truck, and may be outfitted for almost any scenario. The T 815- series was introduced in 1983, and has benefitted from five major updates over the years, many having to do with military requirements or emissions compliance around the world. It is exported to over 50 countries, used mainly by the military, but is also popular in the rugged Siberian oil fields, the Alaskan timber industry, and as a Fire/Rescue vehicle throughout Europe. The huge backbone frame carries independently suspended halfshafts, all driven and all lockable, giving the 815 unequalled performance on and off road. It is the only known truck so rugged that operators in Eastern Siberia have erected a monument to it. The unique Tatra differential design allows unprecedented flexibility without the use of CV joints, making the driveline more rugged while remaining simple to service. The backbone frame offers 10X torsional stiffness and 5X bending stiffness advantages over conventional designs. The compliant suspension then allows up to 30% higher speeds in challenging conditions than other makes – one of the reasons that Tatra has won more Dakar Rallies than any other truck. The example seen here is a medium COE (cab-over-engine, two passenger with berth) 6x6 with an air-cooled Tatra V-12 engine and 5-speed Allison automatic transmission. It was sold new to an Alaskan logging company, and was used for field recovery and transport of broken logging equipment. The nearest dealer is in Venezuela.